Ben & Cally from Infinite Wave Cornish Agates knows exactly what we mean! 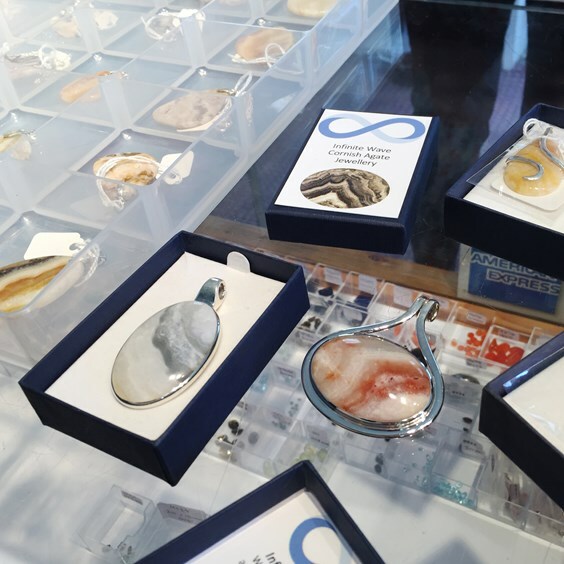 They're a small business just like us, collecting Cornish agates from local beaches and transforming them into pieces of jewellery. We've been working closely and they both come and visit us at our counter service from time to time, looking for ethical and beautiful supplies to make their jewellery special. We wanted to get to know them a little better! 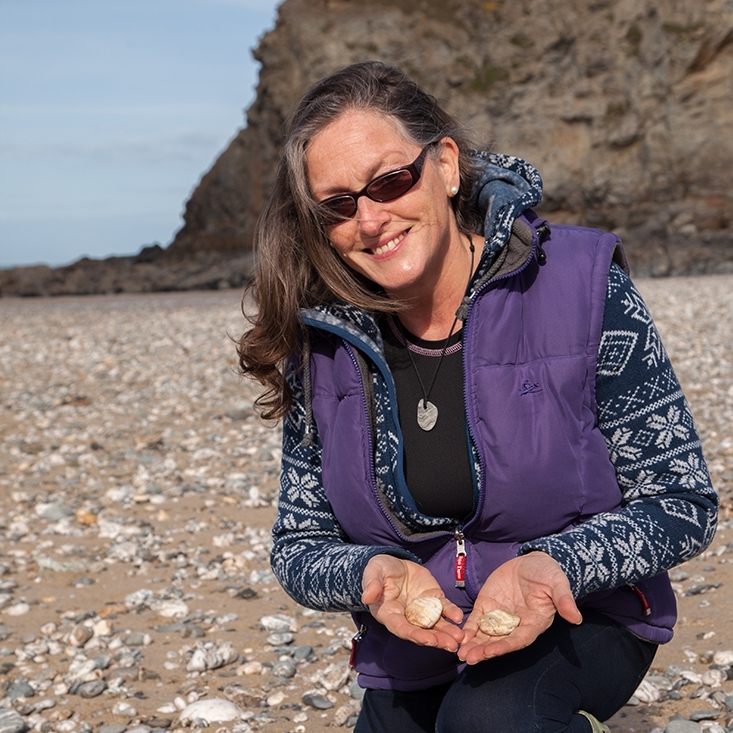 In this interview, we chat to Cally about how the business started, how to get into beachcombing and what beaches you should be visiting! We hope this inspires you and that you've discovered another small Cornish business to follow. 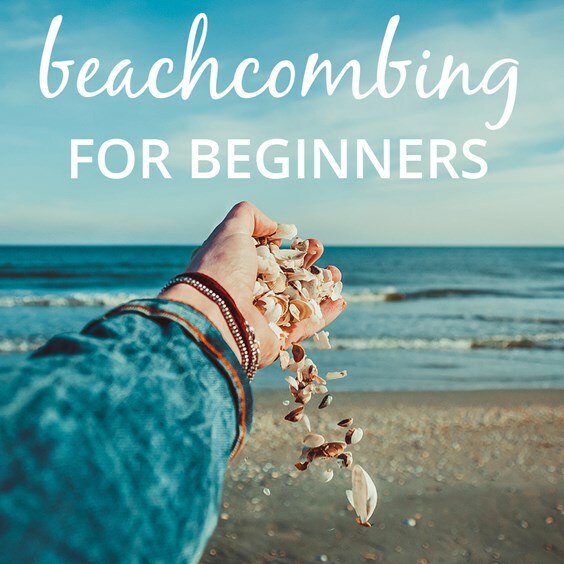 Fancy beachcombing yourself? Read Cally's top tips if you're a beginner! 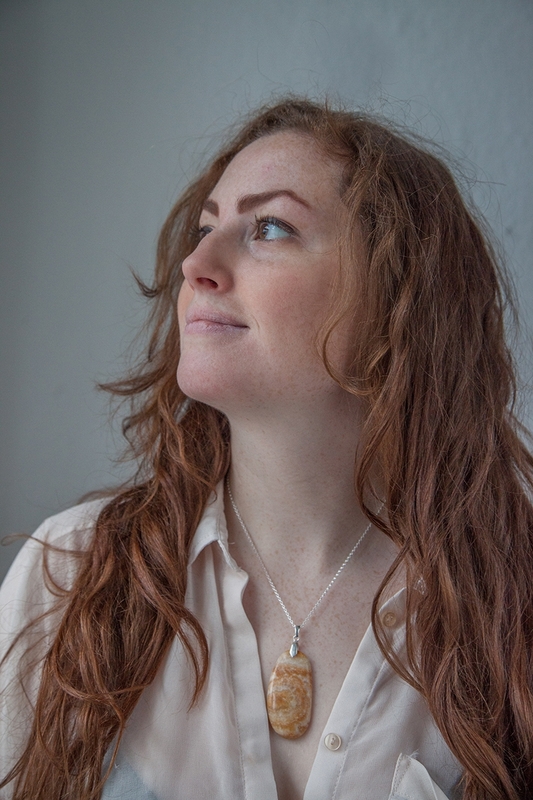 Hi Cally, tell us how Infinite Wave Cornish Agates started and the inspiration behind it! We have both loved walking on the beach ever since we could walk, and as geologists we love collecting so keep a look out for fossils, minerals and gemstones wherever we are. We had been told “Cornwall doesn’t have any good agates” and wanted to show that Cornwall has beautiful subtle coloured agates with the banding that defines a true agate. Working with gemstones that are 240 million years old and Cornish is exciting. Ben is a geologist and lapidary (he cuts and polishes stone) and has a background in teaching and travel photography and leads international expeditions for young people aged 15-18. 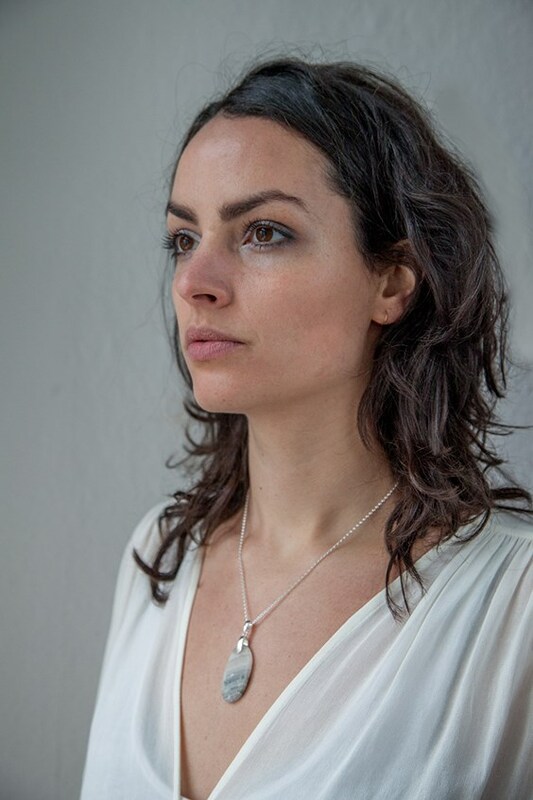 His Infinite Wave Jewellery designs have been inspired by living 100 steps from the beach on the north Cornwall coast. My background is as an Earth Science Education Consultant and Gemmologist, working with schools, universities and museums; including the Natural History Museum, London, where I was the Curator of Gemstones. I am also an author and guest lecturer, have had 15 books published and have appeared on TV and radio. My love of gems, jewellery and the outdoors influences my designs. 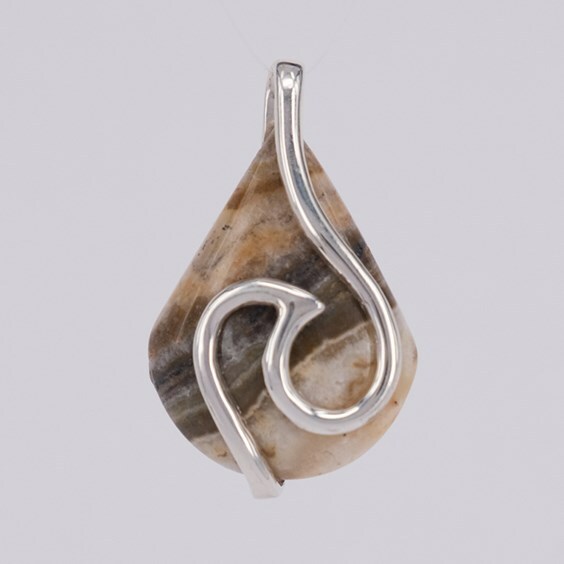 How would you describe Infinite Wave Cornish Agates and your jewellery in 3 words? We both love the outdoors and enjoy sharing our enthusiasm for geology. We offer a beachcombing experience on the beautiful north coast of Cornwall where we will help you search for your own Cornish Agate. We aim to provide a unique insight and help you understand more about the rocks, cliffs and pebbles on the beach. You will have time to appreciate the scenery that the coastline of north Cornwall offers and, whilst exploring the beach, will experience some mindful moments along the way. You may choose to leave your favourite finds with us to be cut and polished or made into your own piece of uniquely personal jewellery. What have been your favourite commissions and why? 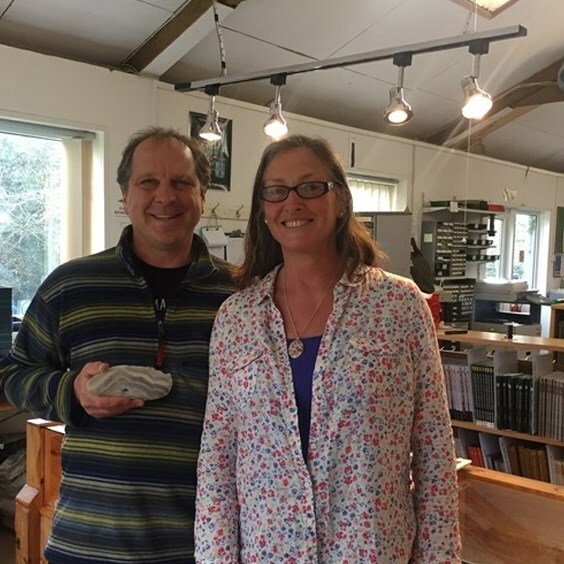 Our favourite commission was the result of a beachcombing experience which led to a piece of Infinite Wave Jewellery for one of our good friends who, while intending to give it as a birthday present, could not resist giving it to his wife as soon as he got home. Another was a request for a pair of pendants made from slices of the same pebble – a gift from a father to his two daughters to help reconcile a falling out. What’s your favourite thing about living in Cornwall? Living by the sea and meeting so many wonderful people. There are so many different types of Cornish agate! But which is your favourite? My favourite is the Cornish Grey agate. It evokes the idea of surf captured in stone. The banding is subtle, but the patterns are amazing. I also like the reddish coloured Cornish Blush agate, because it is both attractive and the rarest colour that we have found. What has been the best way to get your business noticed in Cornwall? Having attained the ‘Made in Cornwall’ accreditation, we are able to attend events like the Made in Cornwall Christmas 2017 Event on Lemon Quay in Truro from Wednesday 29 November to Sunday 3 December, and network with others who share our love of Cornwall and all that is Cornish. You both do a lot of craft fairs in Cornwall and events, what would be your top tip for someone looking to go to one themselves? Visit the craft fairs and chat to the stall holders before deciding which are most likely to have customers that suit you best and will be wanting to buy your products. Also check out the parking – setting up a stall when you can’t park up close by may exhaust you, even before you have stood at the stall all day. Remember less is more - it is better to have a small number of exceptional items for sale and taking centre stage, than have them lost amidst a messy display of less distinctive or smaller items. What is said to be the healing properties of Cornish agate? I am a crystal healer and love working with the energies of the Cornish agates. 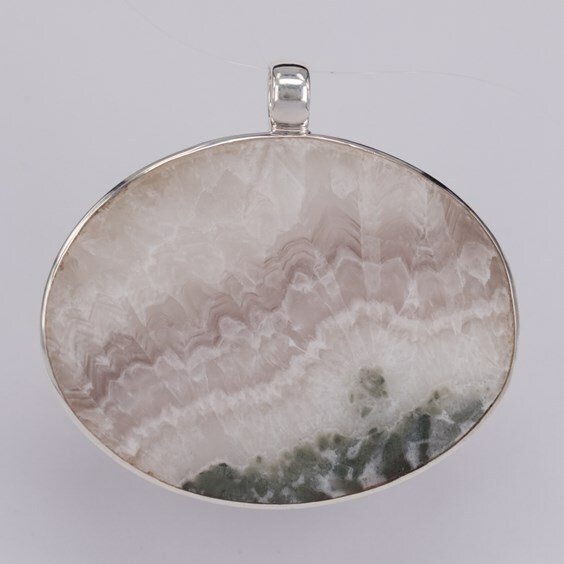 I find that the more vibrant agate with the dark bands that we call Cornish Pol-dark agate, and the Cornish Caramel agate help energise, while the cooler colours of Cornish Grey agate and Cornish Cream agate have a calming effect. 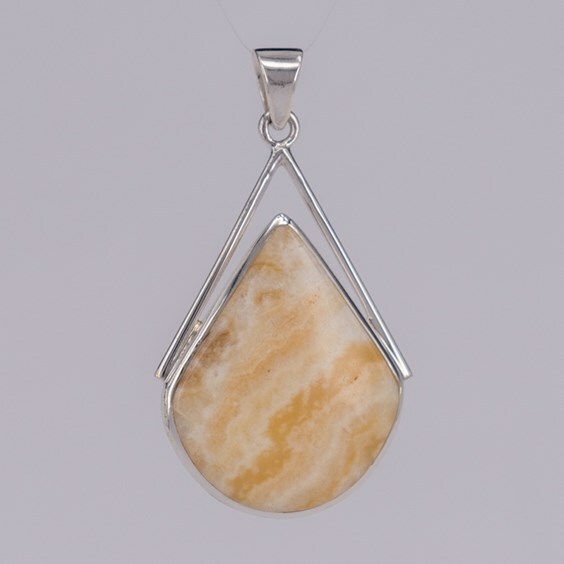 What’s your favourite jewellery design with your Cornish agates? We each have our favourite design. Mine is the cabochon with the gentle wrap-around wave in Sterling silver. Ben’s favourite design in Sterling silver is inspired by Venetian glass jewellery, though his favourite shape is the surfboard as this embodies the spirit of Infinite Wave Jewellery. We love the wave design, what was the inspiration behind these? We have used the waves of the Cornish coastline as our inspiration. What has been your favourite discovery when searching for Cornish agate? Finding a deserted beach with a spectacular waterfall splashing down the cliff, then standing beneath it in the sunshine and looking around and seeing a rainbow in every direction. Being surrounded by colour was amazing. What’s the best beach to find agates - or is it top secret? One of the wonderful things about the Cornish beaches is that they change with the tides and seasons. As the amount of sand and pebbles on each beach fluctuates, so does the chance of finding agate pebbles. It took us almost two years of researching and visiting potential collecting sites to develop an effective method of finding the best Cornish agates to work with. Our favourite beaches for finding agates are on the north coast, especially those close enough for us to walk to. Where can we find you on a Sunday afternoon? Often on the beach, but we also love to discover new parts of Cornwall and enjoy walking along the coastal paths, in woodland and on the moors. Ben is an avid mountain biker, caver and mine explorer, so he could be on his bike or underground – or out on a photo shoot. What can we expect from Infinite Wave Cornish Agates in 2018? 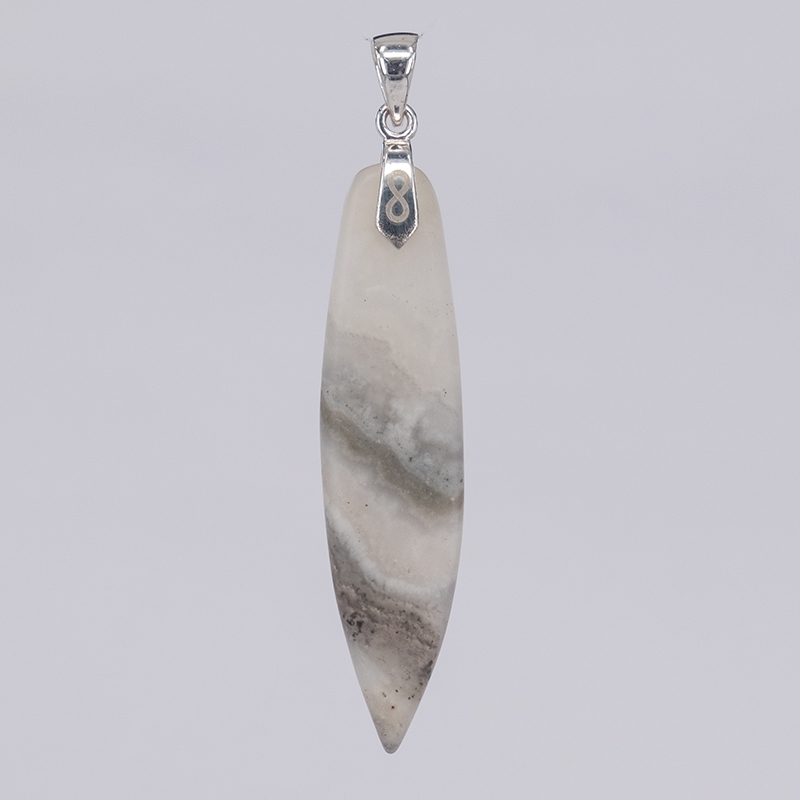 Our surf board designs are popular, both worn on a cord on the beach or in the sea, or with a Sterling silver pinch bail and chain for the smarter occasions. We love that they are being worn by both men and women and aim in 2018 to develop a matching collection of wrist bands incorporating Cornish agate to suit all ages. We are also developing a range of earrings. 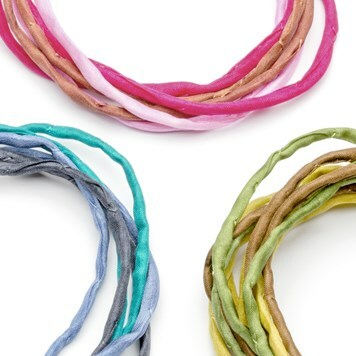 We love the brightly coloured satin cords from Kernowcraft and will be offering these along with the drilled agate slices, to be worn as pendants. Even the names of the colours sound exotic for example wine, emerald, fuchsia, olive, and hazelnut. They feel so wonderfully silky and look fabulous. 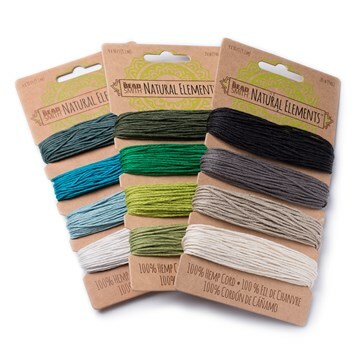 Our aim is to be ethically responsible and use natural products where possible, so we use Kernowcraft natural hemp cords for some of our pendants. I was attracted to the subtle colours, particularly the aquamarine, green and blue that remind me of the colours of the sea; and the sandy browns, browns and greenish browns that match the colours of the sand, the seaweed and the cliffs. 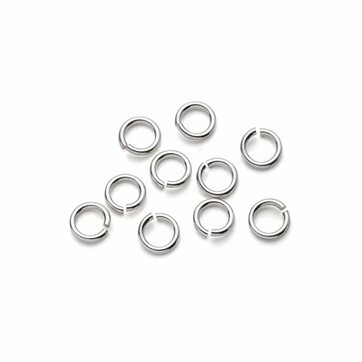 We use only Sterling silver and recommend Kernowcraft jewellery findings for their extensive range of quality jewellery making findings and the fact that they have what we need including jump rings, clasps, head pins, links, and earring scrolls. Living nearby, we are especially lucky that before making our final choice, we can drop in and view items from the website, guided by the expert advice of Kernowcraft staff. Always wanted to go beachcombing? 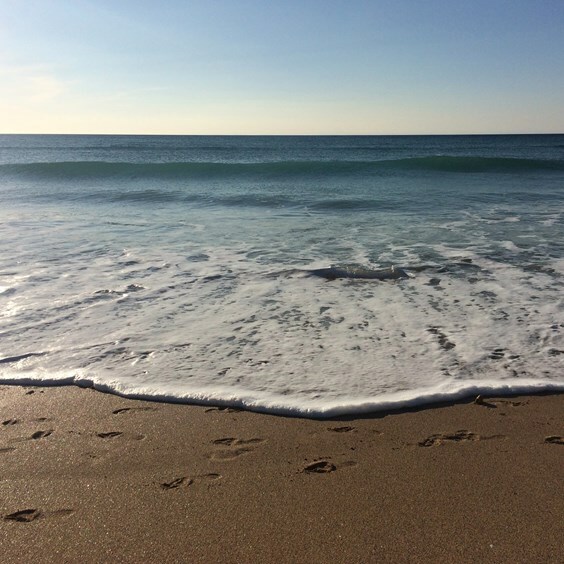 Cally shares her top tips when visiting your local beaches, on the search for something special for your jewellery designs. From stocking up on reading material to visiting the beach at a certain time!